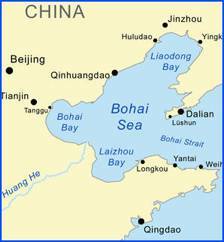 The Bohai Sea borders northeastern China's most populous and highest economic value coastal areas where several megacities are located. Critical infrastructure facilities exist or are under construction, including a nuclear power plant and super port facilities. Large reserves of oil have been discovered and a number of offshore oil platforms have been built. The extent of development along coastal areas requires a better assessment of potential tsunami risks. Although tsunamis do not pose as much of a threat as earthquakes in this region, locally destructive tsunamis have been generated in the past and future events could have significant impacts on coastal populations and China's economy, particularly because most of the development has taken place in low-lying regions, including river deltas. The present study examines the geotectonics of the Bohai basin region, the impact of past historical events, and the potential for local tsunami generation from a variety of direct and collateral source mechanisms triggered by intra plate earthquakes. More specifically, the present study examines: a)major active faults bounding the Bohai Basin; b) the resulting crustal deformation patterns of tectonic structures that have resulted in catastrophic earthquakes in recent years; c) the basin-wide extension - with local inversion - extending into the Bohai Sea that generated tsunamigenic earthquakes in 1888 and 1969; and d) deformational future seismic events with the potential to generate local tsunamis directly or by collateral mechanisms of folding, en-echelon bookshelf failures, or from destabilization/dissociation of structural accumulations of gas hydrate deposits within the basin's thick sedimentary stratigraphic layers. The Bohai Sea (also referred to as the Bohai Gulf or Bay, or just the Bo Hai) is a semienclosed coastal, shallow sea on the northeastern coast of China. The gulf is formed by the Liaodong Peninsula to the northeast and the Shandong Peninsula to the south (Fig. 1). It has a mean depth of about 20 m and a maximum depth of about 70 m near the northern coast of the Bohai Strait where it connects with the Yellow Sea (Fig. 2). Bo Hai consists of three bays: Laizhou Bay to the south, Liaodong Bay to the north, and Bohai Bay to the west. Major rivers, the Huang He, the Liao He, and the Hai He empty into Bo Hai. The Bohai Sea borders northeastern China's most populous and highest economic value coastal areas where several megacities are located in developed regions of Shandong, Hebei, Liaoning and Tianjin Province. Dalian, on the the eastern shore of Liaodong Peninsula of Liaoning Province, is an example of such a developing coastal megacity. Figure 1. Bohai Sea, NE China. Critical infastructure facilities exist or are under construction throughout the region. Currently, China has nine nuclear generators in commercial operation along its eastern coasts. The first nuclear power plant in the northeast - the Hongyanhe Nuclear Power Plant - is being constructed at the Donggang Town of Wafangdian City, in Liaoning. Furthermore, large reserves of oil have been discovered and a number of offshore oil platforms have been built or are under construction. The extent of development along the coastal areas of the Bohai Sea requires a better assessment of potential tsunami risks. Although tsunamis do not pose as much of a threat as earthquakes in this region, locally destructive tsunamis could be generated in the future that could have significant impacts on the coastal populations and the economy of China, particularly because most of the development has taken place in low-lying regions, including river deltas. The present study examines the geotectonics of the Bohai Basin region, the impact of past historical events and evaluates the potential for local tsunami generation from a variety of direct and collateral source mechanisms triggered by earthquake, landslides or other collateral occurrences. 2. SEISMOTECTONIC SETTING OF THE BOHAI BASIN AND SEA. The collision of India with the Asian mainland during the earliest Eocene (~50 Ma) has resulted in the growth of the world's largest orogenic belt - the Himalayas and the associated Tibetan plateau. The seismicity of the entire region is the result of extension caused in part by crustal extrusion of Southeastern Asia (Tapponnier and Molnar, 1977; Peltzer and Tapponnier, 1988; Pararas-Carayannis, 2008d). China's seimotectonic evolution is characterized by the merger of several microcontinents throughout the entire Phanerozoic (Zhang et al., 1984; Hendrix and Davis, 2001; Yin and Nie, 1996). The collision and associated convergence and extension have created 64 major tectonic zones in China, which can be subdivided into a smaller number of tectonic "regions" (Davies et al. 2001; Zhang et al., 1984). The seismotectonic setting of eastern China is complex. Most of the large earthquakes in the region are associated with a mechanism of eastward extension that results in shallow crustal mass transfer. The extension process was initiated by early Tethyan Torsion and subsequent Sinian Torsion which continued during the Cenozoic (Fig. 3). The Bohai Basin was formed during the Late Quaternary to the east of the Cenozoic rift basin of North China and underwent compound and complex tectonic events during its formation and development (Ye, et al., 1985; Hellinger et al, 1985). The Basin is an apparent collage of island arcs and possible microcontinental blocks on the Mongolian accretionary fold belt and has a complex seismotectonic setting (Davis et al., 2001). It covers an area of about 200,000 km2. Two different deformational mechanisms have been proposed for its Cenozoic formation (Castellanos & Mann, 2005). The first mechanism postulates a two-stage extension consisting of Paleogene rifting in a WNW-ESE direction followed by Neogene thermal subsidence. The two-stage rifting mechanism is attributed to the combined rollback of the subducted Pacific plate beneath the Asian continent, lithospheric extension of the overriding continental plate, and to thermally-driven, regional subsidence (Ye et al., 1985). The second postulated mechanism pertains to a more localized Cenozoic pull-apart basin - formed at a right-step in a right-lateral shear system parallel to the Asian continental margin (Allen et al., 1997). Either of the postulated evolutionary mechanisms of pull-apart rifting or subduction/rollback could account for the extensive deformation that has taken place in the Bohai Basin and has created the recent predominent strike-slip faulting and the right-stepping pull-apart control on a younger sag section. Either mechanism can account for the significant and evolving structural changes and the formation of dense seismic zones in the Bohai Basin, that can generate tsunamis. Most of the numerous strike-slip and normal faults on land in the Liaoning, Beijing, Tianjin, Hebei and Shandong Provinces are active structures responsible for a number of major destructive earthquakes in the past. The earthquakes have occurred along numerous active faults that bound the Basin. The Bohai Sea is part of this inner-land sea basin. Similarly, the geotectonics of the Bohai Sea are complex. Regional compressive stresses have formed a series of active tectonic zones and a group of conjugated shear fracturing systems on land which extend into the sea. Since the Oligocene period, there has been active subsidence in the middle part of the Bohai Sea, forming an extensive depression known as "Bozhong" (Yu et al., 1995). This is the area that is rich in oil. The extensive subsidence has been caused by the superimposition of local tensional stresses produced by the left-lateral strike-slip on the Beijing-Penglai seismogenic zone, the right lateral strike-slip on the Yingkou-Weifang fault zone and the activity of the pull-apart structural system in the eastern basin, as well as by the uplift of the deep mantle (Xu et al, 2004). The major part of this depression in the northwest quadrant is bounded by the north-west trending Beijing-Penglai fault zone and the north-north-east trending Tan-Lu fault zone (Xu et al, 2004) (Fig. 4, Fig.5). The long-term crustal deformation patterns in the Bohai Basin and Sea - as determined from GPS measurements (Chen et al., 2007) - exhibit a relatively complete left-lateral strike-slip movement along the active fault zone, although there is also some evidence of reverse type of faulting movement that could be significant for tsunami generation. Most of the recent small and large earthquakes in the Bohai Basin had ruptures with prominent NE orientation, although, further north, there is also a seismic dense zone that has a NW direction (Fig. 5). However, studies of crustal deformation by stages (Chen et al., 2007) also indicate that a series of NE-trending large-scale, anomalous gradient zones have appeared along the Zhangjiakou-Bohai Sea fault zone. The seismicity of the basin is stronger south of the 39th parallel - and this is the area where most of the larger earthquakes have occurred in the past. Almost all of the dense seismic zones that can produce strong earthquakes are concentrated in this southern part of the Bohai Sea (Wang, 2007). As the historic record indicates such shallow seismic activity near densely populated areas as Haicheng or Tangshan can be extremely damaging. Also, such earthquakes can generate local tsunamis. Fig. 5. Major seismotectonic and seismogenic fault zones in the Bohai Basin and Sea. Earthquake epicenters and focal mechanisms of recent earthquakes. Bathymetry based on GEBCO digital data base (modified graphic, after Yang & Xu, 2004 and Xu et al,. 2004). According to historical records there have been 6 great earthquakes of Ms 8 and 16 major earthquakes of Ms 7 in the area, in the past 2000 years (Gu, 1983; Ma, 1988, Pararas-Carayannis. 2007). Generally, these large earthquakes have occurred along the major active faults that bound the Bohai Basin. Numerous strike-slip and normal faults on land in the Liaoning and Hebei Provinces are the predominant active structures where very destructive earthquakes occurred more recently. As previously indicated, the fault-plane solutions of earthquakes in the area usually show right-lateral strike-slips with prominent NE orientation, although some had NW orientation with a normal dip-slip component. Reccurrence frequencies also vary. Although earthquake recurrence intervals along any individual fault in the Bohai Basin is relatively long (usually in the range of several thousand years), the composite recurrence interval for the whole region is in the order of a few decades (Ma et al., 1989). Five earthquakes with Ms > 7 have occurred in this region between 1966 and 1976. These earthquakes resulted in hundreds of thousands of casualties and in significant economic damage. Worse of all was the July 28, 1976 Tangshan earthquake in the Hebei Province. The complex intraplate earthquakes in North China are presently being studied by US institutions funded by the National Science Foundation’s PIRE (Partnerships for International Research and Education) in close collaboration with numerous Chinese institutions. The studies include integration of seismic imaging of earth structure, geodetic measurement of crustal deformation, paleoseismic reconstruction of earthquake histories, and geodynamic computer simulations. Such studies are expected to provide a better understanding as to the causes of large earthquakes in Northeast China, such as the 1976 Tangshan event that leveled the city and caused the greatest death toll in recent history. 3A. 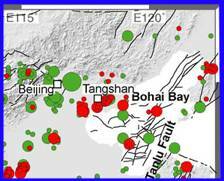 Historical Bohai Basin Earthquakes and Tsunamis. A review of recent and historic earthquakes is relevant in assessing the potential for tsunami generation in the Bohai Sea. As stated, six earthquakes of Ms 8 and sixteen earthquakes of Ms 7 occurred in the past 2,000 years - some of which were tsunamigenic (Wang J., 2007; Pararas-Carayannis, 2007). The records are not clear, particularly for the older events. According to these records, tsunamigenic earthquakes occurred in 1548 and in 1888 (Fig. 6). Other possible tsunamis may have been generated by earthquakes in 173 and in 1597, although the latter is doubted as being a strong event (Wang, 2007) - thus the reported tsunami may have been generated by a collateral mechanism. Many more tsunami must have occurred but have remained undocumented. Fig. 6. 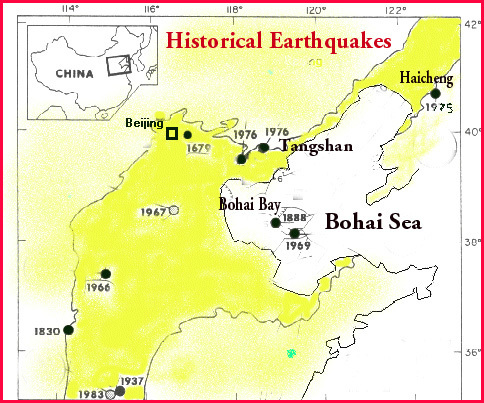 Historical earthquakes in the Bohai Sea and in Northeast China. The September 22, 1548 earthquake had an estimated magnitude M 7.0 and epicenter at about 121.0 E. Its latitude is not known but it is believed that it occurred at sea. The earthquake of October 6, 1597 had an estimated magnitude of M 7.0 and epicenter at about 38.5 N. 120.0 E. The most significant tsunamigenic earthquakes occurred in 1888 and in 1969. The tsunamigenic earthquake of June 13, 1888 had an estimated magnitude M 7.5 and epicenter at about 38.5 N, 119.0 E. (Wu and Zang, 1989). 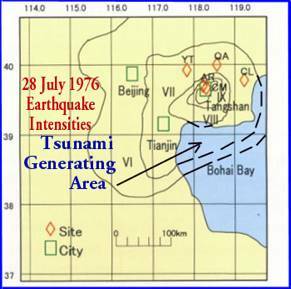 The most recent tsunamigenic earthquakes in the Bohai Sea occurred on July 18, 1969. On February 4, 1975, and on July 28, 1976, there were major earthquakes in the Bohai Basin. The 1975 Haicheng and the 1976 Tangshan earthquakes were extremely destructive. The two 1976 Tangshan earthquakes in Hebei Province resulted in the greatest death toll in recent history. Their impact on land around Tangshan has been described adequately in the literature but there has been no information on whether a tsunami was generated. However, the seismic intensities, the aftershock distribution and the observed crustal movements of the Tangshan quake,s indicate that the coastal region of Bohai Bay was impacted, and therefore a local tsunami must have been generated but not reported. Apparently, the degree of earthquake destruction on land shrouded the damaging effects and impact from a tsunami. The shallow tsunamigenic earthquake of July 18, 1969 in the Bohai Sea had an estimated Richter magnitude of M 7.4 and epicenter at 38.2 N, 119.4 E. Its strike was f=195°, its dip angle was d=85 degrees and its slip angle l=65 degrees. The seismic moment was M o=0.9x1019, its rupture length was L=59.9km and the rupture propagation speed was estimated at Vr=3.5km/s; The angle from the strike to the propagation direction were n wL R =160 (Wu & Zang, 1989, 1992) (Fig. 7). The quake generated a small tsunami with a height ranging from 1~2 m. above normal tide level. The tsunami was responsible for losses in the coastal region near Tangshan in the Hebei Province, but no details are available. Also, no details are available as to the height of the tide at the time of the earthquake and whether the 1 to 2 meter reported tsunami occurred at high or low tide (Pararas-Carayannis, 2008a). Fig. 7. Epicenter and major aftershoks of the Earthquake of July 18, 1969 in the Bohai Sea. The Haicheng earthquake of February 4, 1975 had magnitude M=7.3 and epicenter at 40.6 N, 122.8 E (Chen Y. et al. 1976, Zhu and Wu, 1982; Wang et al., 2006; Pararas-Carayannis, 2008b). The region where it occurred is characterized by an active structural system which extends, not only in the Haicheng-Yingkou region but, also along the entire South Liaoning Province. The seismic activity on this structural system is mostly concentrated along a belt bounded by the Liao River depression and the Liaodong Peninsula uplift (Earthquake Administration of Liaoning Province). The activity of the tectonic structure is oriented in NW direction and has formed a series of active faults as well as new folds. Active faults in the region with a NE orientation include the Niuju-Youyangou, the Jinshanling, the Shuangtaizihe-Zhaojiabaozi fault and the Jinzhou. Other faults in the area include the Dayanghe, the Ximuhe, the Zhuanghe and the Yalujiang (Earthquake Administration of Liaoning Province). Fig. 8. Epicenter, major aftershocks of the Earthquake of February 4, 1975 near Haicheng, Liaoning Province. The epicenter of the Haicheng earthquake was located in the region where faults with the NE and NW directions converge, but do not intersect. Stress along the Dayanghe fault - which has a NW orientation - was apparently released by this earthquake (Figure 8 ). Although far from the sea and thus did not generate a tsunami, the same seismic zone extends into the Bohai Sea, so there is the potential for future tsunami generation if an earthquake occurs closer to the coast of Liaodong Bay or on the Yellow Sea coast of Liaoning Province. patterns indicate that the main rupture plane of this event involved a left-lateral strike slip with a NWW orientation (strike = 288°, dip = 78° N, rake = 342°). Subsequent studies of the seismic waves estimated the seismic moment to be 3 x 1026 dyne-cm and the source duration 7 sec. Since the fault length of this earthquake was about 22 km, the observed P waves supported a rupture velocity estimate of about 3.2 km/sec. The average dislocation was computed to be 2.8 m and the stress drop about 53 bars (Cipar, 1979). 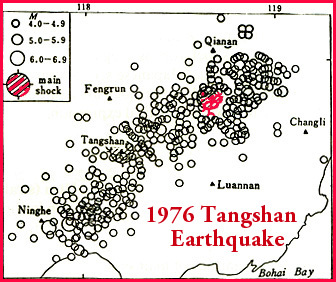 Two earthquakes on July 28, 1976 in the Hebei Province of northeastern China struck and totally destroyed the city of Tangshan (Pararas-Carayannis, 2008c). The main quake had magnitude of M 7.8 (later revised to Mw 7.6) and epicenter at 39.4 N. 118.0 E. (Fig. 9). later, that had a magnitude of M 7.1 and epicenter at 39.7 N., 118.5 E. (Mei, 1982; Pararas-Carayannis, 2008c). Both events were shallow (15 km) and occurred near the coast of Bohai Bay. Many strong aftershocks followed the main earthquake, two of which had magnitudes of 6.0 or more. In the following days, there were many more aftershocks ranging in magnitude from 5 to 5.5. Several months later, on Nov 15, 1976, a magnitude 6.0 earthquake struck again the same region (Pararas-Carayannis, 2008c). The intensities of the 1976 earthquake’s ground motions were extensively surveyed and reported (Figure 10). In the epicentral area the intensity was estimated at XI (State Seismological Bureau). The region with intensity X was reported as being elliptical in shape and covering a total area of about 370 km2. The region of intensity of IX was reported as being rhombic in shape, also trending in a northeast direction and covering an area of about 1,800 km2. The region of intensity VIII extended in a southeastward direction and covered an area of about 7,300 km2. The region of intensity VII was reported to cover an area of about 33,000 km2. Fig. 10. Intensities of Ground Motions of the Tangshan Earthquake (after Wang Fang 1976, State Seismological Bureau of China). Postulated Tsunami Generating Area. The zone of maximum destruction was estimated to be about 47 square kilometers. It included the city of Tangshan and the southern suburb along the Beijing-Shanhaiguan railway. Over a four-by-five mile area the devastation of the city was nearly total. About ninety-three percent of residential buildings and seventy-eight percent of commercial and industrial buildings in Tangshan were destroyed. The actual death toll from this earthquake may never been known with certainty. According to official government accounts the earthquake killed 242,769 people and severely injured another 169,851. However, based on the density of the population and the extent of destruction, these figures have been disputed. At the time Tangshan had 1.6 million inhabitants. Since the earthquake destroyed ninety three percent of all residential buildings, the death toll was estimated to be three times greater than what was reported - ranging from 655,000 to 779,000 people. The extremely high death toll makes the 1976 Tangshan event the second worse earthquake disaster in recorded history. The most destructive earthquake ever, occurred four centuries earlier in 1556 in Shaanxi, China. It is estimated that the 1556 earthquake killed 830,000 people. Another earthquake in the Gansu region in 1920 had killed about 200,000. The 1976 earthquake ruptured a five-mile (8 km) section of a 25-mile strike-slip fault with a north-northeast orientation that passes through the city Tangshan. The fault is part of an extensive strike-slip fault system, known as Tancheng-Ljiang, or Tan-Lu. This system extends in a north-northeast direction for more than 3,200 miles from the north bank of the Yangtze River in eastern China to the west across the Russian border. Specifically, the earthquake occurred at the junction of the YanShan fold-fault zone and the Cangdong fault zone. The YanShan fold-fault zone runs in an east-west direction and lies north of the Tangshan region. To the south, there are several sub parallel northeast-trending fault zones known as the Shanxi fault depression structural belt, the Taihang piedmont fault zone, the Cangdong fault zone, and the Tangcheng-Lijiang fault zone. According to the scientific literature, each of these zones has produced several earthquakes. Several episodes of uplift and other anomalous variations along different segments of the fault zones that comprise the Yan Shan Seismic Belt have been reported. There were substantial ground movements along the segment of the fault that ruptured. Along the west side the ground moved laterally for about five feet in a north/northeast direction, sub parallel to the major axis of the meizoseismic zone. However, in some areas, horizontal ground displacements of up to 7 meters were subsequently measured. On the eastern side of the rupture, the ground block tipped upward near the south end and downward at the northern end. The quake's intensities, the aftershock distribution, the crustal displacements and the downward tilting at the southern end must have included a good portion of Bohai Bay, thus a local tsunami must have been generated. Tsunamigenic earthquakes have been generated in the past along active tectonic structures that crisscross the Bohai Sea. In spite of predominantly lateral strike-slip components that characterize most earthquakes in this region, destructive local tsunamis may be generated by a combination of direct and collateral mechanisms that could involve upward and downward crustal block movements, folding of thick sedimentary layers, landslides, destabilization of gas hydrates deposits and mass sediment flows. Analysis of relations between structures and stratigraphic units along cross sections in the Bohai Basin using broadband instrumentation (Zhao & Zheng, 2005), infers the occurrence of past, multiple, deformational seismic events and confirms the basin-wide extension with local inversion which extends extensively into the Bohai Sea. Furthermore, from studies of recent earthquakes in China (Pararas-Carayannis, 2007, 2008) and additional review of the literature on the evolution of Bohai Basin, it has become apparent that the principal regional compressive stresses from crustal extension in this region have a NEE-SWW orientation in the central part of the Bohai, in line with the Beijing-Penglai seismogenic zone but a NE orientation further offshore, in line with the Tan-Lu Fault (Fig. 4, Fig. 5). Counter clockwise drag is responsible for the apparent dextral torsion in this eastern region. Stresses from the crustal extension have formed a series of active tectonic zones and conjugated shear fracturing systems on land, as well as in the Sea. According to recent literature (Chen et al., 2007), the Zhangjiakou-Bohai Sea seismotectonic zone controls the present-day strong earthquake activities in the region. Other major active tectonic zones include the northern section of the northeast trending Yingkou-Weifang and the Miaoxibei-Huanghekou-Linyi fault zones, and the northwest striking Beijing-Penglai fault zone, which intersect at the center of the Bohai Sea basin - as partly illustrated in Figures 4 and 5. These tectonic zones subdivide the Bohai Sea area into four secondary neotectonic areas, which are subject to a dominant horizontal, or nearly horizontal, compressive stress field in the direction NE60–90 degrees, while the tensional stress is in a NW30 degree direction (Chen et al., 2007). The long-term crustal deformation patterns in this region exhibit a relatively complete left-lateral strike-slip movement, but there is also some evidence of reverse type of faulting movement (Wang, T., 1988). Although poorly mapped, reverse faults, normal faults and strike-slip faults reach far into the Bohai Sea. Sea floor movements from earthquakes occurring along reverse and normal faults have the potential to generate tsunamis. Fortunately, most of the earthquakes in this eastern region of the basin have relatively short ruptures, thus sea foor displacements would tend to be limited and tsunamis would be localized. For example, the 1976 Tangshan earthquake ruptured only a five miles (8 kms) along a 25-mile section of a strike-slip fault. Obviously, the multi-directional orientations of the highly fractured faults in this region create asperities which limit rupture length. However, the ground motions of the Tangshan earthquake, the distribution of intensities extending into the Bohai Bay and the observed upward movement of the ground block near the south end of the rupture, as well as the downward movemeny of the crustal block at the northern end, infer that anomalous disturbances of the sea floor can occur along coastal areas of Bohai Bay near Tangshan, as well as in areas further offshore. There were apparent gravity anomalies before and after the earthquake (Chen Y. et al. 1976). Similar ground movement anomalies have been associated also with other historical tsunamigenic earthquakes along faults bordering coastal areas of the Yellow and South China Seas. 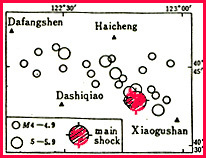 Similarly, the 1974 Haicheng earthquake had a short rupture with a NW orientation along the Dayanghe fault. Its epicenter was located in the region where faults with the NE and NW directions converge, but do not intersect. Although far from the sea and could not have generated a tsunami, the quake was along a fault in the same seismic zone which extends into the Bohai Sea. Thus, there is potential for future tsunami generation if an earthquake occurs closer to the coast of Liaodong Bay. In brief, local destructive tsunamis can be generated by earthquakes along shear fractures in the Bohai Sea, but particularly along the NE-trending and more active tectonic zones south of the 39th parallel. 4B. Potential for Tsunami Generation from Collateral Mechanisms - Sedimentary folding and En-echelon structural failures. As indicated, most of the earthquakes in the Bohai Sea involve primarily crustal movements with lateral, strike-slips which usually do not generate large tsunamis. 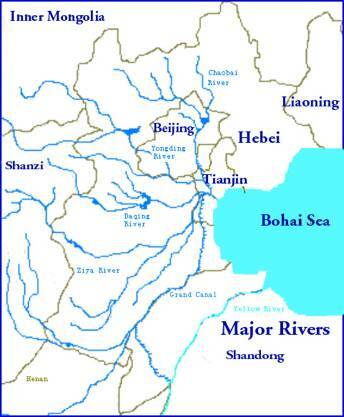 However, the Bohai is loaded with sediments carried by major rivers such as Huang He, Luan He, Liao and Alu Jiang (Fig. 11, 12). The excessive sedimentation may be a significant factor for tsunami generation. Fig. 11. 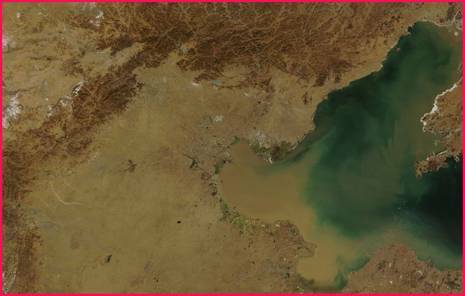 Satellite photo showing the heavy load of sediments from major rivers flowing into the Bohai Sea. Deformational seismic events - which apparently occur frequently - have the potential to generate local tsunamis directly or by collateral mechanisms of stratigraphic folding and/or by en-echelon bookshelf failures of the thick sedimentary layers, or by the triggering of submarine landslides. To assess such potential tsunami mechanisms, the structural and tectonic evolution of the Bohai Basin must be re-examined and evaluated. Major rivers deposit large loads of sediments in the the Bohai and Yellow Seas and have created unstable slopes on the shelf that could become potential sources of landlside-generated tsunamis. Fig. 12 Major rivers deposit large loads of sediments in the the Bohai and Yellow Seas and have created unstable slopes on the shelf that could become potential sources of landlside-generated tsunamis. Apparently, geological structure played an important role in the development of palaeochannels in the North China Plain and in the offshore areas. Mountain uplift, subsidence of the plain, and tectonic movement of the basement since the Cenozoic, have interacted with the flashy fluvial regime involving high sediment loads and frequent channel changes (Xu et al, 1996). Over eons of time, the numerous rivers traversing the Bohai Basin have deposited great quantitities of sediments which have filled out full grabens or half grabens - bounded by conjugated shear fracturing systems - which extend into the sea. Thus, the tectonics of the region have influenced changes of the ancient river systems and channels - although now these channels are buried by sediments. Processes of channel development from present tectonic activity continue. Although the Bohai Sea is not a region near a zone of subduction, the predominent lateral compressive forces of earthquakes along faults that bound the buried grabens, can result in folding and/or in oblique-to-the-rupture bookshelf-types of failures within the thick layers of the loose surficial and the compacted, deeper sediments. The deeper sedimentary layers are probably well consolidated but still prone to folding or en-echelon failure from the tectonic compressive forces, which could generate tsunamis in the manner illustrated by Figure 13. Subjected to similar forces, the surficial sedimentary layers would be more susceptible to slumping and landslides. Slumping or folding could generate local tsunamis. However, the potential for tsunami generation from submarine landslides would tend to be limited and localized, since the Bohai is a relatively shallow sea and the slopes are relatively gentle. Fig. 13. Tsunami Generation by Compressive Folding of Deeper Sedimentary Layers in the Ductile Zone and En-Echelon and Bookshelf Faulting of Surficial Layers. In brief, future tectonic movements associated with larger earthquakes in this region - and the compressive forces they generate - could interact with the now submerged fluvial regimes that contain high sediment loads and thus could generate massive sediment movements - even on relatively gentle bathymetric slopes. Such movements could contribute to local tsunami generation. Folding and en-echelon bookshelf type of failures of the deeper consolidated sediment layers could become collateral mechanisms for greater tsunami generation. Such collateral mechanisms can contribute significantly to the generation of destructive local tsunamis anywhere in the Bohai Sea, but particularly south of the 39th parallel, where the denser seismic zones are concentrated, the seismicity is stronger, and greater sedimentation from the Huang He river (Yellow River) has occurred. 4C. En-Echelon Structural Failure Within Consolidated Sedimentary Layers - Mechanism of Tsunami Generation. As indicated, stress and tectonic displacements caused by an earthquake along a fault - whether strike-slip, normal, or inverse - in a multi-layered sedimentary environment such as that of the Bohai Sea, can induce structural failures that may be oblique to the overall fault orientation and thus result in collateral displacements, en-echelon structural failures, and bookshelf faulting of the seafloor that could enhance tsunami generation. Shear cracks along a fault may be vertical and planar but may result in splits into two or more interacting sections at a stratigraphic interface with different density and stress drop - depending on rigidity contrasts between the adjoining media. 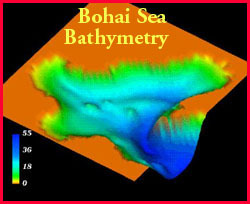 The deeper sediments along such faults in the Bohai Sea may be characterized by different elastic parameters, depending on the degree of hydration, particle size distribution and compaction densities. 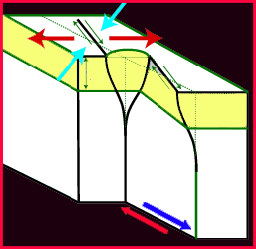 Structural inhomogeneities within these deeper, better-consolidated layers may result in a series of bookshelf type of structural failures, which will be oblique in orientation to the overall faulting trend. Oblique, en-echelon type of failures could result in multiple ruptures that could also affect the sediments of the upper layers - thus changing the spatial geometry and characteristics of the source area and the mechanism of tsunami generation. Slower rupture rates with different azimuthal orientation can be expected within these layers. Furthermore, net sea floor displacements can be expected to vary and the tsunami's directivity to be different from what may be inferred from fault orientation or focal plane solutions. For example, the simplified mechanical/geometrical effects left by a model earthquake within a transform fault plane at the sedimentary discontinuity interphase have been extensively investigated by employing the "displacement discontinuity method" (Bonafede & Neri, 2000). Figure 14 illustrates a simple case of such stress-induced displacement discontinuity and the potential changes in the geometry and characteristics of the tsunami source. Additional investigations have dealt with the two-dimensional dynamics of shallow reverse type of faulting upon discontinuity interphases (Madariaga, ?). However, in an actual multi-layered sedimentary environment such as that which exists in the Bohai Sea, the geometrical complexities and stress drop values can be expected to vary along planar strike-slip or reverse faults. Faulting in such an environment cannot remain planar. Strike-slip faulting at depth may be accompanied by en-echelon surface breaks in a shallow sedimentary layer - where the stress drop may be lower at the discontinuity interphase, while ductile deformation at depth may be accommodated by antithetic faulting in the upper brittle layer - enhanced with lower rigidity but higher stress - thus resulting in bookshelf faulting that can augment tsunami generation and alter tsunami directivity (Fig. 14). Such bookshelf failure of sedimentary layers are believed to have resulted in the augmentation and apparent directivity from the north (rather than from the west) when the tsunami of December 26, 2004 struck Aceh, in Sumatra. It is believed that similar bookshelf and en-echelon failures within subducted sediments were associated with the September 2, 1992 earthquake off the coast of Nicaragua and enhanced the tsunami runup (Pararas-Carayannis, 1992). Indeed, studies of aftershock distribution of earthquakes around the world indicate extensive concentration of their focal depths along sedimentary bedding planes - which would also support that such failure mechanisms contribute to tsunami enhancement and differences in azimuthal tsunami source parameters (Figures 13, 14). Similarly, en-echelon failures with elevated and depressed portions of ramp could alter the sea floor and contribute to tsunami generation (Fig. 15). Fig. 15. 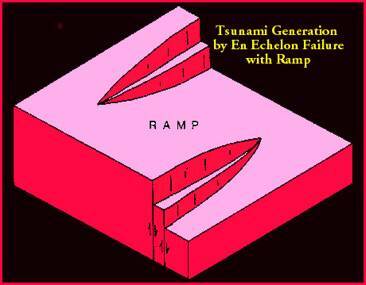 Tsunami Generation by En Echelon Step Fault Displacement and by Sea Floor Changes with Elevated and Depressed Ramp Structure. Therefore, we may conclude that such distribution of aftershocks - localized along sedimentary discontinuity layers - not only would indicate the asymmetric interactions between the original fault plane of an earthquake and the shalower sedimentary layers, but would also indicate that significant residual, compressive or tensile stresses can remain over the shallower portion of the fault surface, after the major shock and fault rupture. Thus, strong aftershocks of major or great earthquakes in such sedimentary environments could be significant in tsunami generation and could trigger, at a later time, collateral submarine landslides or other sea floor collapses and structural failures. In brief, the potential for tsunami generationt in the Bohai Sea is exacerbated by the thick accumulation of sediments (in different states of consolidation) and the multi-layered stratigraphic distribution of sediments with different shear strengths, densities and rigiditites. Folowing an earthquake, en-echelon, bookshelf type of failures with oblique directivity to the general strike orientation could impart greater tsunami energy and alter tsunami directivity. Thus, any mathematical modeling study must consider such complexities of source inputs for such environments of extreme sedimentation. 4D. Potential for tsunami generation from destabilization of Gas Hydrate deposits and mass sediment flows. As indicated, the Bohai Sea is a region rich in oil and natural gas. Great offshore oil fields, such as the Shengli, the Dagang the Jidong, the Suizhong and the Chengbei, were discovered in recent years and are now being exploited. Numerous oil platforms, scattered in the Bohai, pump huge quantities of natural gas and oil which supply China's increasing energy needs. Apparently, there are also huge structural accumulations of natural gas hydrates (primarily methane hydrate) near known fault systems (Watson et al.,1987). Such gas hydrates must exist in different configurations below the sea floor and include massive thick solid zones, continuous layers, nodules, and widely disseminated interstitial material in the different sedimentary layers. Each of these types of hydrate accumulations may affect differently the seafloor stability. Such natural gas hydrate deposits may be transitionally unstable in shallow (first meters below seafloor) sediments in areas where seafloor temperature or pressure changes over time. Repetitive gas hydrate formation and decomposition are known to cause sediment deformation, slumps, gas blowout craters, and increase the rate of gas and oil venting to the water column (Milkov, 2002). Since collapse of hydrate-bearing sediments is accompanied by the generation of excess pore pressureand the release of amounts of methane gases, it is likely to cause a breakdown of offshore structures and slope failures. Furthermore, gas hydrate accumulations, if destabilized and dissociated by an earthquake's ground motions and the associated changes in pressure, could cause mass sediment flows - and thus generate local tsunamis (Max, 2002). Dissociation of gas hydrate in surficial sediments, as illustrated by Figures 16 and 17, could reduce substantially the shear strength of distinct layers and result in the formation of a thixotropic mass which could act as a slip surface for subsequent structural failure and downslope mass sediment flows. In brief, hydrate-bearing sediments in the Bohai Sea may destabilize spontaneously by an earthquake’s ground motions or slowly on their own without a triggering mechaniss. Often the mere pumping of oil or natural gas could result in destabilization. Often, gas production methods include depressurization, inhibitor injection, thermal stimulation, and their combinations, or intentional gas extraction from the hydrate itself. The dissociation of the gas hydrate deposits by earthquake ground motions, particularly near offshore oil platforms, could result in large scale slip and sediment mass flows and be a collateral mechanism for tsunami wave generation or enhancemnt. Combined with extensive surface ice during the winter months, local tsunami waves could possibly cause damage to oil rigs operating in the Bohai Sea, as well as to nearby coastal facilities, by the transport and impact of large pieces of floating ice. Given this scenario extensive damage could occur, even with tsunami waves of moderate height amplitude. Fig. 17. 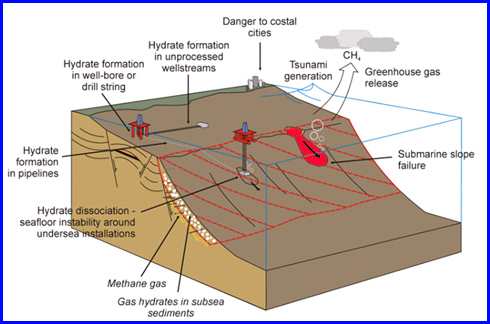 Structural slope failure and potential tsunami generation from the dissociation of gas hydrates (Modified graphic of the National Energy Technology Laboratory, U.S. Department of Energy (DOE)). 4E. Effects of Astronomical Tides and Ice on Potential Tsunami Destructiveness in the Bohai Sea. The tides in the Bohai Sea are relatively high (Fig. 18). The tides are primarily dominated by semidiurnal (M2 and S2) and diurnal (K1 and O1) motions (Xu et al 1996). 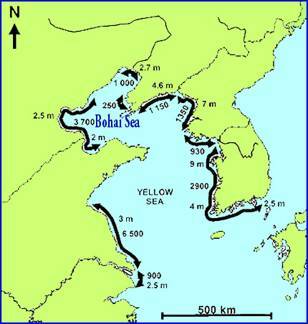 The range of tide heights varies significantly from a minimum of about 2 meters along the shores of Laizhou Bay, to 4.6 meters along the eastern coasts of the Liaoning Province on the Korea Bay, as much as 7 meters along the western coast of North Korea, and even as much as 9 meters further south along the coast bordering the Yellow Sea. The large extent of the astronomical tide variation could have a signifincant effect if a tsunamigenic earthquake occurs at high or near high tide. For example, if a tsunami was generated at high tide, the eastern shore of Liaodong Peninsula of the Liaoning Province could experience waves that could be 4.6 meters higher than those generated at low tide. Thus, events occurring at high tide could be significantly more destructive. For example, the site where the cooling system of the Hongyanhe Nuclear Power Plant is located could be impacted by tsunami waves that could be 2.7 meters higher than waves generated at low tide. Fig. 18. Extent of astronomical tide height variation along coastal areas of the Bohai and Yellow Seas (Modified after Xu et al. 1996). Similarly, the numerous offshore oil platforms that are scattered throughout the Bohai Sea may be susceptible to potential damage if a tsunami is generated in the region. As indicated, given the relatively shallow water depths and the abundant ice-infested waters of the region during the winter months, large pieces of ice carried by the tsunami waves could have a destructive impact. Although ice-induced forces on oil platfom structures and vibrations have been studied in the past (Zhang and Wang, 2008), the dynamic forces from ice carried by tsunami wave action have not been evaluated. The severity of the potential impact would depend on the design of the platform structures. Being more rigid, caisson-built oil platform structures would be expected to fare better than the more common, jacket-built type of oil platform structures which are lighter and weaker. The Bohai Sea surrounds one of China's most populous and highest economic value regions. Recent earthquakes on land have had great impact. Tunamis do not pose as much of a threat, but locally destructive tsunamis could be generated in the future which can be expected to have more significant impact since most of the recent development has taken place along low-lying coastal areas where several megacities are located and infrastructure facilities exist or are under construction. In spite of predominantly lateral strike-slip components that characterize most earthquakes in this region, there is also evidence of reverse type of faulting movements. Although poorly mapped, reverse faults, normal faults and strike-slip faults reach into the Bohai Sea and earthquakes occurring along such faults can generate tsunamis. Destructive local tsunamis may be generated by earthquakes along shear fractures in the Bohai Sea, but particularly along the NE-trending and more active tectonic zones south of the 39th parallel. 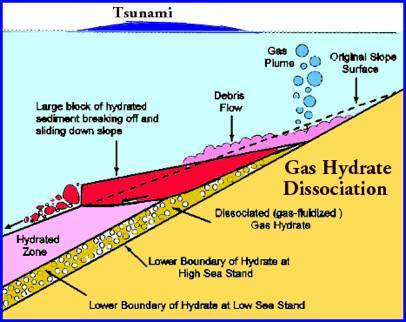 Local tsunamis may be also generated by a combination of collateral mechanisms that could involve folding of thick sedimentary layers, landslides, destabilization/dissociation of gas hydrates deposits and mass sediment flows. Future tectonic movements associated with larger earthquakes in this region could interact with the now submerged fluvial regimes that contain high sediment loads and thus could generate massive sediment movements. Folding and en-echelon bookshelf type of failures of the deeper consolidated sediment layers could become collateral mechanisms for greater tsunami generation, particularly in areas where denser seismic zones are concentrated, the seismicity is stronger, and greater sedimentation has occurred. Thus the potential for tsunami generation in the Bohai Sea is exacerbated by the thick accumulation of sediments and the multi-layered stereographic distribution of sediments with different shear strengths, densities and rigidities. Following an earthquake, en-echelon, bookshelf type of failures with oblique directivity to the general strike orientation could impart greater tsunami energy and alter expected tsunami directivity. Finally, dissociation of the abundant gas hydrate deposits by an earthquake ground motions, particularly near offshore oil platforms, could result in large scale slip and sediment mass flows. Combined with extensive surface ice during the winter months, local tsunami waves could possibly cause damage to oil rigs operating in the Bohai Sea, as well as to nearby coastal facilities, by the transport and impact of large pieces of floating ice. Bonafede, M.; Neri, A., 2000. Effects induced by an earthquake on its fault plane:a boundary element study. Geophysical Journal International, Volume 141, Issue 1, pp. 43-56, 2000. AGU Fall Meeting, San Francisco, CA. 2005. Chen, Yun-Tai; Gu, Hao-Ding; Lu, Zao-Xun, 1976. "Variations of gravity before and after the Haicheng earthquake, 1975 and the Tangshan earthquake, 1976", Physics of the Earth and Planetary Interiors, Volume 18, Issue 4, p. 330-338. Chen Guo-guang, Xu Jie, Ma Zong-jin1, Deng Qi-dong, Zhang Jin and Zhao Jun-meng, 2007. Recent tectonic stress field and major earthquakes of the Bohai sea basin, Acta Seismologica Sinica, Volume 17, Number 4 / July, 2004, pp.438-446, Published by Springer in Earth and Environmental Science, 2007. Cipar John 1979, "Source processes of the Haicheng, China earthquake from observations of P and S waves", Bulletin of the Seismological Society of America; December 1979; v. 69; no. 6; p. 1903-1916. Davis, G. A., Zheng, Y., Wang, C., Darby, B. J., Zhang, C., and Gehrels, G., 2001, Mesozoic tectonic evolution of the Yanshan fold and thrust belt, with emphasis on Hebei and Lianoning provinces, northern China: Memoir - Geological Society of America, v. 194, p. 171-197. Earthquake Administration of Liaoning Province, Quan Yingdao, "An Earthquake of MS7.3 in Haicheng, Liaoning Province on February 4, 1975", World Data Center for Seismology, Beijing. Hellinger, S.J., Shedlock, K.M., Sclater, J.G. and H. Ye, 1985. The Cenozoic evolution of the north China basin, Tectonics 4 (1985) 343–358. Hendrix, M.S., and Davis, G.A., 2001, Paleozoic and Mesozoic tectonic evolution of central Asia: from continental assembly to intracontinental deformation: Boulder, Colo., Geological Society of America, vi, 447 p.
Keilis-Borok, V. I. and Soloviev, A., (Edis. 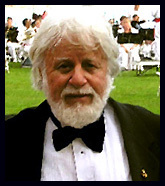 ), 2003. Nonlinear Dynamics of the Lithosphere and Earthquake Prediction. Springer-Verlag, Berlin-Heidelberg. Ma, L. and Gao, X., 1996. The state of intensive monitoring and prediction at the Metropolitan Area before Asian Game in 1990. He, Y. N. (Ed. ), The Selected Papers of Earthquake Prediction in China, Dedicated to the 30 th International Geological Congress, Seismological Press, Beijing, 255-259. Max, Michael D. 2002, Mass Flow in Marine Sediment: Physical Causes and Possible Examples from the Geological Record, Tsunami Society Symposium, Honolulu, Hawaii 2002. Mei, S. R. (Ed. ), 1982. Tangshan Earthquake in 1976. Seismological Press, Beijing (in Chinese, reviewed abstract in English). Milkov, Alexei V. 2002, Global Distribution and Significance of Natural Gas Hydrate. Tsunami Society Symposium, Honolulu, Hawaii 2002. Ye, H., Shedlock, K.M., Hellinger, S.J. and J.G. Sclater, 1985. The north china basin: an example of a Cenozoic rifted intraplate basin, Tectonics 4 (1985) 153– 169. Yin, X. C., Wang, Y. C., Peng, K. Y. and Bai, Y. L., 2000. Development of a new approach to earthquake prediction: Load/Unload Response Ratio (LURR) theory. Pure Appl. Geophys. 157, 2365-2383. Yin, A., and Nie, S., 1996, A Phanerozoic palinspastic reconstruction of China and its neighboring regions, in Yin, A., and Harrison, T. M., eds., The Tectonic evolution of Asia: Cambridge [England] ; New York, Cambridge University Press, p. 442-485. Yu Jianguo, Li Sanzhong, Wang Jinduo, Timothy M. Kusky ; Wang Xinhong ; Lu Shengqiang, 1995. 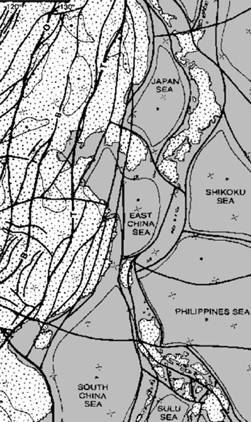 Relationship between salt diapirism and faulting in the central structural belt of the Dongying sag, Bohai Gulf basin, ChinaQuaternary International Volume 25, 1995, Pages 13-17. Zhang, Z.M., Liou, J.G., and Coleman, R.G., 1984, An outline of the plate tectonics of China: Geological Society of America Bulletin, v. 95, p. 295-312. Zhang, G. M. and Ma, L. (Eds. ), 1993. Study on the Datong-Yonggao Earthquake. Seismological Press, Beijing (in Chinese; reviwed English Abstract). Zhang, Y. X., Liu, G. P., Chen, Q. F., Ma, L. and Yang, W. Z., 1998. The feature of anomaly evolution before Shunyi M S 4.0 earthquake and estimation for the tendency of the quake by LURR. Earthquake 18(1), 49-56 (in Chinese). Zhang, Y. X. and Liu, G. P., 2000. Study on characteristics of anomalies near by epicenter of Zhangbei M S 6.2 earthquake and their spatial and temporal evolution. Earthquake 20(1), 53-58. Zhu, F. M. and Wu, G., 1982. The Haicheng Earthquake in 1975. Seismological Press, Beijing (in Chinese - English abstract). Wang, K., Chen,Q.-F., Sun, S. and A. Wang, 2006, Predicting the 1975 Haicheng Earthquake, Bulletin of the Seismological Society of America, June 1, 2006; 96(3): 757 - 795. Wang Jian, 2007. Historical earthquakes and a tsunami in Bohai Sea. Journal Acta Seismologica Sinica. Publisher Seismological Society of China ISSN 1000-9116 (Print) 1993-1344 (Online), Volume 20, Number 5 / September, 2007. Wang, T.H., 1988. Genetic types of thrust faults in Eastern China petroliferous regions, Earth Sci. 13 (1988) 627– 634. Watson, M.P., Hayward, A.B., Parkinson, D.N. and Z. Zhang, 1987. Plate tectonic evolution, basin development and petroleum source rock deposition onshore China, Mar. Pet. Geol. 4 (1987) 205– 225. Xu Qinghai, Wu Chen, Yang Xiaolan and Zhang Ningjia, 1996. Palaeochannels on the North China Plain: relationships between their development and tectonics. Studies of the Palaeochannels on the North China Plain, Geomorphology, Volume 18, Issue 1, December 1996, Pages 27-35. 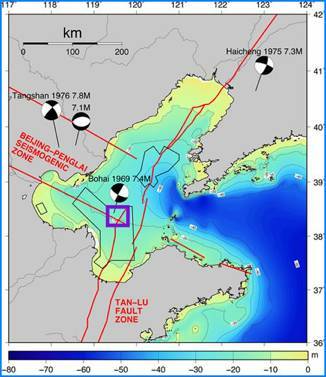 Zhao Liang and Tianyu Zheng, 2005, Seismic structure of the Bohai Bay Basin, northern China: Implications for basin evolution. Earth and Planetary Science Letters 231, Issues 1-2 (Feb. 2005) Pages 9– 22. Zhongliang Wu and Shaoxian Zang, 1992, Seismological Society of China (Acta Seismological Sinica Publisher), ISSN 1000-9116 (Print) 1993-1344 (Online) Issue Volume 5, Number 1 / February, 1992.